LGR & Conventional Dehumidifiers. What Are The Differences ? Cars are so different than they were in the past. They can move much quicker, faster, longer and safer than their predecessors. They can also achieve these results while having engines half the size controlled by complex computer systems. What does this have to do with LGR Dehumidifiers? The story is quite similar in regards to dehumidifiers. In the past, huge dehumidifiers were the standard. Systems were much simpler, heavier and less efficient. Nostalgia can make those gas guzzlers very attractive, but in a restoration situation you want the most modern tools available. Conventional dehumidifiers work by condensing water vapor in the air over refrigerated coils. The moisture filled air is fanned into the dehumidifier where it is cooled below its dew point and begins to condense moisture on the super cold coils. The dry air is reheated by a heat pump that also prevents frost on the coils, and is then exhausted from the machine. LGR stands for low-grain refrigerant, which explains the result and the technology it uses it to achieve it. Grain is a measurement of moisture, which is defined as being a drop of moisture, where 7,000 grains equals one pound. Refrigerant in this context refers to the refrigerating technology used to achieve such low grains. LGR dehumidifiers are very similar to conventional dehumidifiers. They also use super cold coils to condense moisture in the same way as conventional dehumidifiers. They differ though by using a dual cooling system to lower the air temperature to the dew point, so when the air crosses the super cold coils, it is already ready to condense instead of needing to be cooled by those coils. The market just 10 years ago was dominated by conventional dehumidifiers. In our experience it was 90% conventional dehumidifiers and 10% LGR dehumidifiers in the market. The water damage restoration industry doesn’t change that often or that fast. So it’s profound that LGR Dehumidifiers are making up the bulk of the restoration industry today. You will rarely see conventional dehumidifiers used in intense restoration efforts these days. LGR Dehumidifiers have become the standard. Since conventional dehumidifiers are still somewhat cheaper though, and of course still dehumidify, they still have their place in the industry. They work great in mild climates with minimal water damage such as warm weather states with some minor plumbing-based floods. Most conventional dehumidifiers are able to reach around 50% RH, so rooms with no wall damage can usually be extracted and recovered with conventional machines. Lowering the relative humidity below 30% is pivotal in restoration to save the most material possible. All furniture, flooring and wall materials are well below 15% in moisture content. If the relative humidity level in a room doesn’t get low enough, not enough moisture can escape those materials. The relative humidity will trap the moisture within the materials. This will lead to rot and mold growth and will require removal from a job site. The faster and more thoroughly dry you can get a room, the less damage will occur and less has to be taken out and remediated. 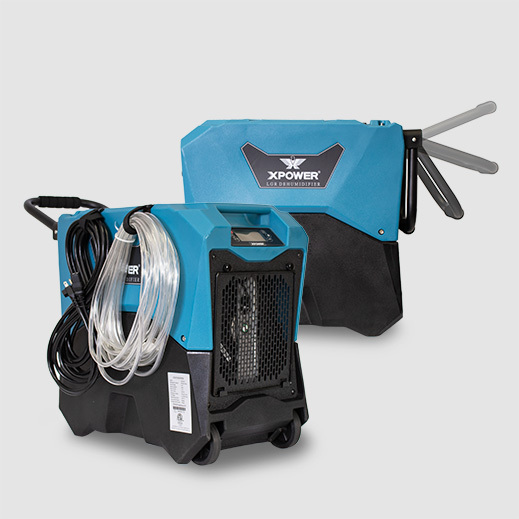 WHAT MAKES XPOWER LGR DEHUMIDIFIER STAND OUT? Low-Grain refrigerant dehumidifiers also work in a much wider temperature range than conventional machines. Conventional dehumidifiers operate at 65 °F to 90 °F. The pre-cooling factor gives LGR machines the ability to work in climates just above freezing to extreme heat. The XPOWER XD-85LH has a temperature range of 33°F – 105°F. This means it can work in any part of the country during any season. LGR Dehumidifiers are so much more efficient that they can be made much more compact and still remove the same amount of moisture in the air as conventional dehumidifiers. At some point, workers were lifting a hundred pound refrigerators onto their trucks on a daily basis. 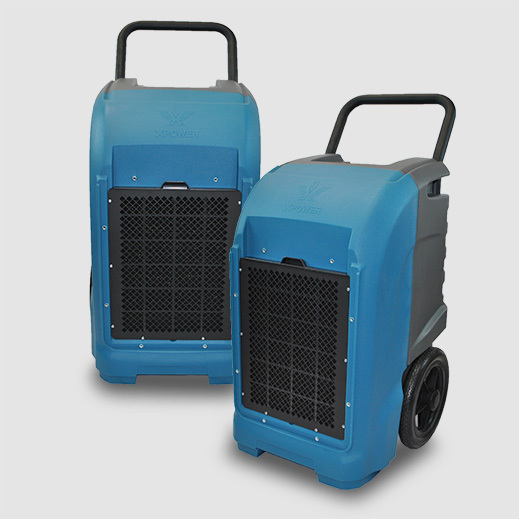 A more compact LGR dehumidifier makes it easier to move machines which decreases loading times and worker injuries. 5. XPOWER LGRs are simply much more efficient, saving you time and energy costs. So if you have the time and money to buy a muscle car. DO IT. But in a restoration situation, you will want the most efficient, gas saving turbo-hybrid SUV supercar that LGR technology provides. VROOM VROOM.